There are many reasons you might wish to purchase the 75-piece set of amazingly heinous gold-plated Versace flatware I’ve recently come to possess through no fault of my own. Perhaps you are an angry gay attorney with a lot of disposable income, desperately searching for a collection of cutlery to complement the glossy black dining table, blue sofa and neon waterfall in your tastelessly decorated domain. The gold-plated Versace demitasse spoon suits any espresso, and would undoubtedly add a sophisticated accent to your endless bitching about the building staff and delivery menus left at your door. And, there are eight of them. With great spoons come great friends, goes the saying. Your acquisition of gold-plated Versace flatware could be the first step in acquiring a posse of mean-spirited dandies to love you for who you really are. Please purchase my recently acquired gold-plated Versace flatware set. Perhaps you are a made member of a crime syndicate. You know quite well that your Cadillac Escalade assault SUV announces your class and stature to the general public on the roadways and sidewalks; but, did you know what announces that same je ne sais quoi to your dinner guests? That’s right. Just like a giant, inflatable rat alerts folks to a content non-union construction site, a gold-plated Versace sauce ladle tells folks you’re the boss. Absolutely nothing adds more class to the timeless act of sauce relocation. Your friends and enemies alike will give you the respect you crave. And your family will know they made the right decision not having you “dealt with” last Easter when you were acting all sassy to a Capo. Please consider purchasing my recently acquired gold-plated Versace flatware set. Overnight Hip-Hop success? Firstly, let me congratulate you on parlaying a fascination with vice, three gunshot wounds, and a history of felonies into a career. You know as I do that one must not only represent, but one must represent with style. Style is not just gold teeth, gold chains, gold rims and gold car antennas, my friend. Style is also gold-plated Versace flatware. The late-night recording sessions are draining, G. To keep pace and deliver more phat raps about whores and liquor, you’re going to need sustenance. That sustenance is cake. And cake, my G, is best served with a gold-plated Versace cake server. What your entourage does with the remaining 74 cutlery pieces is unimportant. What matters is getting your cake on with class. Please, someone, purchase my recently acquired gold-plated Versace flatware set. Please, I’m serious, purchase my recently acquired 75-piece gold-plated Versace flatware set. Finally, perhaps you are Donald Trump. Please, The Donald, take advantage of my not inexpensive, recently acquired, 75-piece gold-plated Versace flatware set. I watched almost a half-hour of The Apprentice, and think you’ll find the gold-plated dessert forks great for picking up nougat. 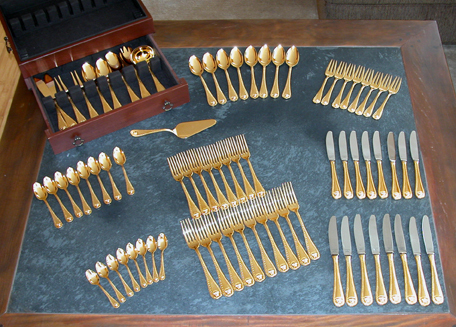 Will anyone purchase my recently acquired 75-piece gold-plated Versace flatware set? This flatware monstrosity once set someone back nearly ten grand. If you think that’s pretty amazing, you’re not the only one. Although I encourage you to purchase it at a high price, it does not mean I will respect you for it. All pieces feature the same gaudy Medusa logo that Versace uses to justify $900 cufflinks. As I’ve mentioned, I hope someone will purchase my recently acquired 75-piece gold-plated Versace flatware set. Perhaps that someone is you.